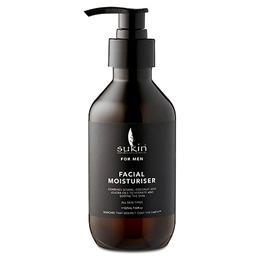 Sukin`s Facial Moisturiser For Men is created with Sesame, Coconut, Jojoba Oils and Aloe Vera to hydrate and soothe. Baobab Extract, Vitamin E and Tasmanian Pepper promote healthy skin, while a blend of Cinnamon and Citrus refreshes the senses. Water (Aqua), Aloe Barbadensis Leaf Juice, Sesamum Indicum (Sesame) Seed Oil, Cetearyl Alcohol, Glycerin, Cetyl Alcohol, Ceteareth-20, Hydrolyzed Adansonia Digitata Extract (Baobab), Tasmannia Lanceolata Fruit/Leaf Extract (Tasmanian Pepper), Cocos Nucifera (Coconut) Oil, Simmondsia Chinensis (Jojoba) Seed Oil, Tocopherol (Vitamin E), Cinnamomum Zeylanicum Bark Oil (Cinnamon), Citrus Nobilis (Mandarin Orange) Peel Oil, Citrus Aurantifolia (Lime) Oil, Piper Nigrum (Pepper) Seed Oil, Phenoxyethanol, Benzyl Alcohol, Limonene*, Cinnamal*. After cleansing, gently massage a small amount into face and neck. Use once or twice daily. Avoid contact with eyes and rinse immediately if contact occurs. Recommend you patch test before use, if irritation occurs rinse immediately and discontinue use. Below are reviews of Sukin For Men Facial Moisturiser - 225ml by bodykind customers. If you have tried this product we'd love to hear what you think so please leave a review. Very nice moisturiser. Really easy on the skin and not greasy. Good to have a natural skin care product for men. Will be purchasing again.